It's been a while since my last post but before leaving Rowland Hilder I want to show this watercolour. 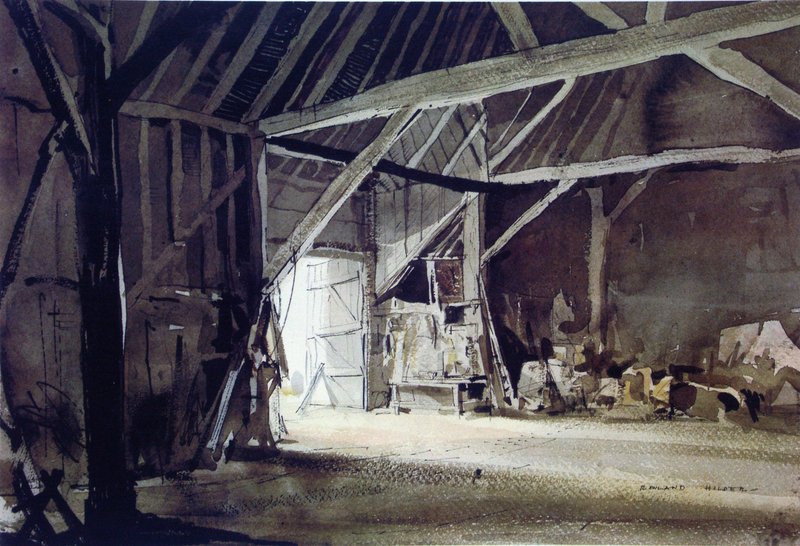 I came across it on the web blog http://one1more2time3.files.wordpress.com/2010/09/rowland-hilder-1.jpg and is a barn interior. I've not found many examples of interior views by Hilder and this is outstanding. The lightness of touch together with strong cast shadows and intense shade give a wonderful sense of atmosphere. The strong light at the entrance where Hilder has left the white of the paper, contrasts with the dark washes of the interior to the left. This, together with fleeting dry brush strokes on the wooden beams and on the floor allows the paper texture to describe an impression of various surfaces within. All in all a masterful rendition.